J Paul Getty Museum, Los Angeles. Hedwig, Duchess of Silesia (1174-1243) was one of eight children born to Berthold IV, Count of Andechs and Duke of Croatia and Dalmatia. Of her four brothers, two became bishops. Her sister Gertrude married King Andrew II of Hungary and their daughter was Saint Elizabeth of Hungary. Hedwig was married at an early age to Henry, Duke of Silesia. They had seven children, including Gertrude, who would become abbess of a Cistercian monastery founded in 1202 by her parents, the first convent of religious women in Silesia. Three of their children died at an early age. Hedwig and Henry were great benefactors who endowed Cistercian, Augustinian and Dominican monasteries, and a hospital. They also consecrated themselves to lives of great austerity, piety and self-sacrifice. After her husband’s death in 1241, Duchess Hedwig assumed the habit and life of a Cistercian at the Abbey of Treblinz, though she did not enter as a religious in order that she could retain her ability to donate to charities. She was known for her great generosity, her care for the poor and sick, and for her piety and gentleness. When she died in 1243 (October 12 or 15), Hedwig was buried in the church attached to the Cistercian monastery in Treblinz. She was canonized by Pope Clement IV on March 26, 1267, and in August of the same year her remains were raised to the honors of the altar (that is, interred beneath an altar). Images of Saint Hedwig often show her with a church, referring to the monasteries she endowed. 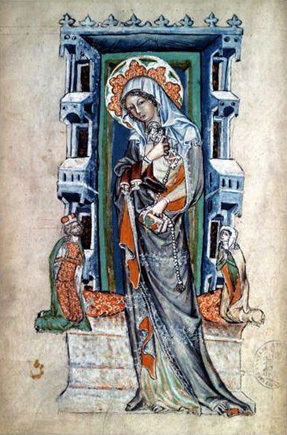 In the image above, she is holding an image of the Blessed Virgin, a prayerbook and rosary, and with her boots folded over her right arm, which refers to her penitential practice of going barefoot. is an example of humility for all. Happy is the husband of a good wife; the number of his days will be doubled. A loyal wife rejoices her husband, and he will complete his years in peace. A good wife is a great blessing; she will be granted among the blessings of the man who fears the Lord. Whether rich or poor, his heart is glad, and at all times his face is cheerful. A wife's charm delights her husband, and her skill puts fat on his bones. A silent wife is a gift of the Lord, and there is nothing so precious as a disciplined soul. A modest wife adds charm to charm, and no balance can weigh the value of a chaste soul. Like the sun rising in the heights of the Lord, so is the beauty of a good wife in her well-ordered home. Jesus' mother and His brethren came; and standing outside they sent to Him and called Him. And a crowd was sitting about Him; and they said to Him, "Your mother and Your brethren are outside, asking for You." And He replied, "Who are My mother and My brethren?" And looking around on those who sat about him, He said, "Here are My mother and My brethren! Whoever does the will of God is My brother, and sister, and mother." O St Hedwig, in this world you rejected the honors of the Court, its pomp, luxury and pleasures, and went to be with the poor to help them in the destitution and misery of life. There in Heaven, cast a kind look on us poor mortals, and obtain for us the grace (mention your request) and that of living in the peace and friendship of God. Amen. R. So that we may be worthy of the promises of Christ. O God, You taught Blessed Hedwig to prefer, with all her heart, the humble road of Your Cross to the pomp of the world. Through her merits and example, grant that we may learn to reject the ephemeral delights of the world, and, embracing Your Cross, may we overcome the adversities to come. You who live and reign, One God, forever and ever.